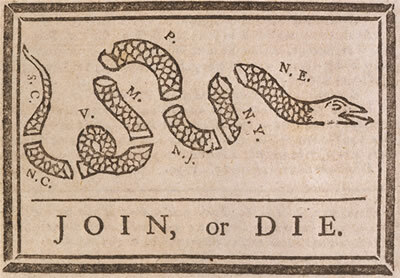 Join Or Die by Benjamin Franklin. The Albany Plan of union was proposed by Benjamin Franklin and called for the formation of a permanent federation of the American colonies. The Albany Plan of Union was a proposal introduced by Benjamin Franklin during the Albany Congress in 1754. Franklin’s plan called for the formation of a permanent federation of colonies, as a means to reform colonial-imperial relations, and to more effectively address shared colonial interests. Introduced on June 19, the commissioners attending the Congress adopted a final version of the plan on July 10. Despite the support of those who attended the Albany Congress, the Albany Plan of Union was rejected by King George II and by all of the individual colonial governments that considered its adoption. The plan was a significant milestone, however, as it marked the first official attempt to develop inter-colonial cooperation among the American colonies.